PictureValuation - specialists in art valuation and art appraisal - for fast, professional, independent, online valuation and appraisal of paintings, watercolours, drawings and prints. Whether you own an Old Master or an iconic piece of Modern Art, a painting by a little known artist or a print of a famous work, use our online art valuation service to find out how much your picture is worth. Or use our service to check the value of a picture before buying or selling. Simply upload some photos of the item, tell us all you know about it, and you'll soon be receiving a valuation from our fine art experts. It doesn't matter if you don't know who the picture is by, or you can't read the signature. Select our Unknown Artist valuation option, and we'll make every effort to track down the artist and provide an accurate valuation. And remember... we charge low fixed fees for our valuations, not a percentage of the value of your art. 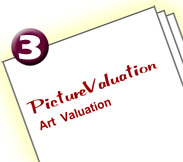 Value your art with PictureValuation today! Select a Picture Type then Known or Unknown Artist to continue. The more you tell us, the more accurate your valuation will be. You'll receive your valuation report by email within 48 hours. Want to find out how our art valuation process works and how to upload your photos? Click here for our art valuation help pages. Not sure what type of picture you have got? Our website includes some helpful information about identifying your art. Having trouble getting a good photo of your art? Have a look at our tips for photographing art. 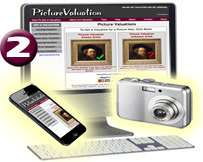 PictureValuation is UK-based and backed by art market professionals of many years' standing. You can be sure of receiving an independent, unbiased and objective art appraisal from PictureValuation, as we do not buy or sell items offered for valuation, or offer to arrange the sale of your items. All art valuations are covered by our Money Back Guarantee: if for any reason we cannot provide a valuation of a picture, you will receive a full refund and any advice we can give you about the picture absolutely free.